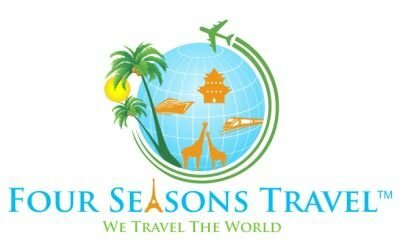 Four Seasons Travel is acting as an intermediary or as an agent for suppliers in selling service or in accepting reservations or bookings for service which are not directly supplied by this agency (such as air carriage, hotel accommodations, ground transportation, meals , tours, cruises, etc.) Four Seasons Travel therefore shall not be responsible for breach of contract or any intentional or careless actions or omissions on the part of such suppliers which result in any loss, damage delay or injury to you or your travel companions or group members. Your retention of tickets, reservations or bookings after issuance shall constitute a consent to the above and agreement on your part to convey the contents hereof to your travel companions or group members. Four Seasons Travel herein gives notice that it cannot be held responsible for any disruption of travel and/or related services in "trouble areas" due to Monetary, Political or Social Unrest, Labor Problems, Mechanical or Construction Difficulties, Climatic Aberrations, Local Laws, Disease or Novel Conditions. By embarking up his/her travel the traveler's) voluntarily assumes all risk involved in such travel, whether expected or unexpected. Traveler is hereby warned of such risks and is advised to obtain appropriate insurance coverage against them. 1. A deposit is required within 24 hours of booking confirmation. Unless otherwise stated. The balance is due at least 60 days prior to the cruise's/tours departure. The deposit amount will depend on the product you are purchasing. Check with one of our agents for specific details. 2. Cancellations penalties vary with each wholesaler, supplier, and package or cruise. Have our agent check and advise you of the specific penalties on your cruise/tour. 4. Four Seasons Travel has the right to cancel a cruise at any time, for any reason. In such cases, full refunds will be made. 5. Prices are subject to change without notice. Prices billed shall be those in effect at time of booking. 6. Taxes are subject to change on group air until entire group is paid in full.